Jocson-Singh, J. and Carlos, A. (2017, April). From Paper to Imagination: Representations of Librarians and Librarianship in Asian Media. Co-Presentation for Popular Culture and American Culture Association National Conference (PCA/ACA), San Diego, California. Jocson-Singh, J. (2016, October). 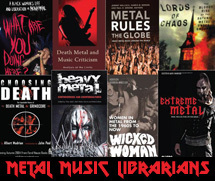 The Media is the Message: Exploring Social Media Research in Metal Music Studies. Paper presentation for round-table: Looking for Metal: Rethinking methodologies in Metal Studies at the Metal in Strange Places: Aural, Emotional, Tactile, Visual Conference, University of Dayton, Dayton, Ohio. Jocson-Singh, J. (2016, May). Women in Rock and Metal Music. Organizer and moderator for round-table. Barnard College, New York, NY. Jocson-Singh, J. and Washington, A. (2016, March). The Library and Librarian in Contemporary TV Series. Co-Presentation for Popular Culture and American Culture Association National Conference (PCA/ACA), Seattle, Washington. Jocson-Singh, J. and Washington, A. (2015, April). The Metropolitan Museum of Art Gets Graphic: Building a Collection for the Library. Co-Presentation for Popular Culture and American Culture Association National Conference (PCA/ACA), New Orleans, Louisiana. Jocson-Singh, J. (2015, April). Individual Thought Patterns: Women in NY’s Extreme Metal Music Scene. Paper Presentation for the first Annual Spring Anthropology Conference, Hunter College, New York, NY. Jocson-Singh, J. (2014, November). Individual Thought Patterns: Women in NY’s Extreme Metal Music Scene. Paper Presentation for the Metal and Cultural Impact Conference (MACI), University of Dayton, Dayton, Ohio. Jocson-Singh, J. (2014, October). Individual Thought Patterns: Women in NY’s Extreme Metal Music Scene. Paper Presentation for Popular Culture and American Culture Association Regional Northeast Conference (NEPCA), Providence College, Providence, Rhode Island.